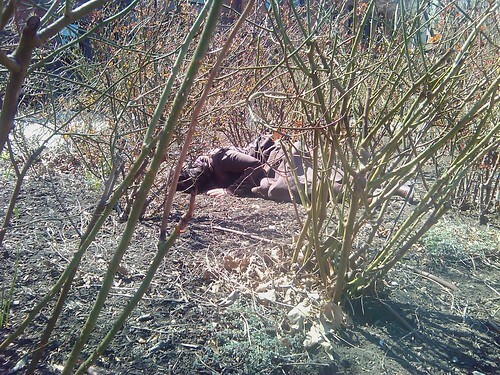 Photograph taken during a performance for "Ban" in Pratt Institute's Rose Garden, April 2013. Fee: $250/$225 for members of Lynden or Woodland Pattern (one discount only). Register online now. Lynden Sculpture Garden and the Woodland Pattern Book Center offer a weeklong-residency at Lynden with poet and writer-in-residence Bhanu Kapil. In addition to the workshop, Kapil will offer a reading at Woodland Pattern on June 1 at 2 pm. The workshop will culminate in a reading by participants, followed by a reception, at Lynden on Thursday, June 5 at 7 pm. We will create posture-gesture sets in the energetic domain of the sculptures we encounter. How can we link our writing-to-be to the garden we are in? How might the sculptures support our work in powerful, non-verbal ways? The dream of the workshop is to extend the somatic and contemplative gestures already present in our writing, and to transform them into postures, movement practices, sensorimotor sequences and bodily progressions of different kinds. How can we create another kind of space to work out the questions we have for writing, and then return them to writing, by the end of our time together? How are our gestures in relation to the other members of the group? How might we return witness notes to each other, and gather together on this different kind of grass? Bhanu Kapil teaches at Naropa University's Jack Kerouac School of Disembodied Poetics in Boulder, Colorado, as well as Goddard College in Vermont. Recent workshops have engaged architecture, animal studies, performance art, and memory as ways to approach contemporary writing. Bhanu maintains a blog, Was Jack Kerouac A Punjabi?, documenting daily and creative practices of all kinds. She also has a long-term private practice as a palmist and bodyworker, with an interest in somatic trauma therapies and Ayurvedic energetics. For several years, she has been incubating her works through performances in India, England and throughout the U.S. Bhanu Kapil is interested in books that break then become.